This Cypress oil displays comparatively high concentrations of sesqui and even diterpene components, which are responsible for the many unique therapeutic properties attributed to Cypress oil, yet practically never delivered by the reconstituted oils of normal trade. 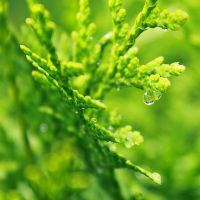 True Cypress oil is a very effective decongestant for veins and lymph. It is also a prostate decongestant and, according to Pénoël and Franchomme very helpful with prostate adenoma. It is very helpful with different conditions of the respiratory tract such as bronchitis, whooping cough, and pleurisy as well as spasms of the respiratory tract. In addition, it is most effective with hemorrhoids and edemas in the lower extremities.